Fifty years after the late James C. Berry started a business managing a couple of airport parking lots, his heirs have sold what has grown into one of the nation's biggest privately owned parking management companies to an even bigger business in the industry. Imperial Parking Corp., based in Vancouver, B.C., and operating under the Impark brand, bought Berry's Republic Parking System on Friday to create one of North America's biggest parking management companies. As a division of Impark, Republic Parking will maintain its headquarters in Chattanooga and its name on more than 770 properties the company operates for cites and airports across the country. 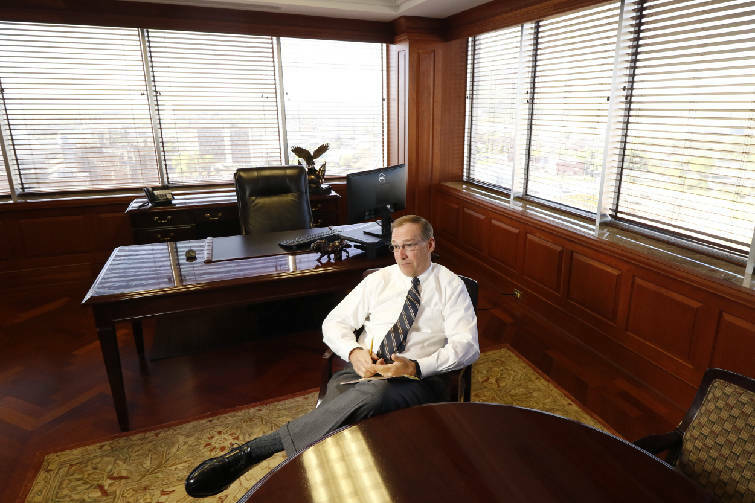 Scott Titmus, President of Republic Parking Systems, speaks about his company's merger with another parking giant while in his office in downtown Chattanooga, Tenn., on April 7, 2016. Republic Parking System President Scott Titmus, who helped negotiate the sale, said the employees and management team will stay in place as well. "So from the standpoint of the customer, the client or the employee, our goal is for this to be completely seamless. In fact, our objective is that they might not even know this has happened." Republic Parking has about 45 employees at its corporate headquarters in Chattanooga. Terms of the sale were not disclosed. But with $370 million in annual revenue from concessions and service fees from nearly 500,000 parking spaces at airports, garages, surface lots and on streets from Alaska to Panama, Republic Parking and its related Republic Parking Northwest were among Chattanooga's biggest family-owned businesses. 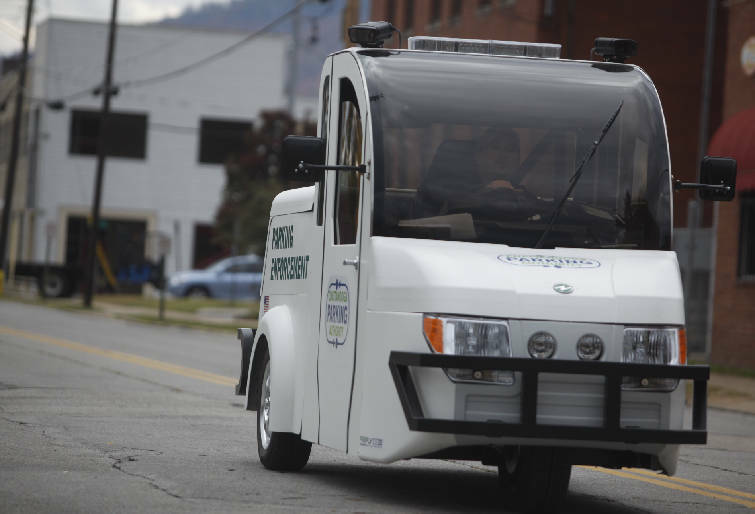 In this 2012 file photo, parking Ambassador Chris King works the area around the Chattanoogan in a Republic parking enforcement vehicle Wednesday afternoon. The vehicle has a pair of cameras mounted on its top which record license plate numbers. The company's headquarters is atop Chattanooga's tallest office building, which bears the Republic name, and will continue to be owned by a Berry family-related real estate business. Allan Copping, chief executive for Imperial Parking, called Republic "a perfect fit" for the growing Impark business. "In addition to increasing the geography and client base served, the acquisition brings expertise in both the airport and municipal parking sectors, as well as a talented and experienced management team," Copping said Friday. Impark is owned by the Ontario Teachers' Pension Plan and has made other acquisitions to expand its U.S. presence. Last October, Impark bought San Francisco Parking Inc., which operates under the City Park brand at 85 facilities in the San Francisco area. Impark has more than 9,000 employees at more than 3,400 locations across North America. But Impark generally serves bigger and different markets than does Republic Parking. "There is very little overlap between these two companies and we felt like culturally and operationally this was the best match-up, and we felt fortunate to achieve this at a favorable valuation," said Titmus, who joined Berry in 1995 and has served as Republic Parking System president since early 2013. Republic Parking and Impark operate in most cities under cost-plus management contracts, where operators collect a fee above all parking expenses. But as parking moves toward computer apps, remote payments and automated lots, management companies and lot owners must spend more to install new technologies and meters. Berry grew up in the Great Depression in Mississippi and started in the industry parking cars for the Allright Parking Co. He built Republic Parking System into a national company that in 2011 acquired Municipal Citation Solutions, a software system that operates ticketing systems, to manage parking citations in Chattanooga and about 20 other cities. Staff Photo by Doug Strickland/Chattanooga Times Free Press - May 16, 2013. Jim Berry, owner of the Jim Berry Company, stands in the lobby of the newly remodeled Liberty Tower Thursday in Chattanooga, Tenn.
Berry, who died in November 2013 at age 82, owned all of Republic Parking System in Chattanooga and 70 percent of Republic Parking Northwest in Seattle. Gary Beck, who owned the other share of the Seattle operation and is president of Republic Parking Northwest, said joining with Impark will "create the leading parking operator in the Pacific Northwest and continue the tradition of service excellence to our clients." A family trust that controlled Republic Parking after Berry's death made the decision to sell in early 2015, Titmus said. None of Berry's five children now work for Republic Parking, although Berry's daughter-in-law, Ashley Berry, works in marketing and Berry's grandson, Britton Stancell, is general manager of the company's Chattanooga operations. Berry's widow, Carlydia Berry, also has been involved in the business. "Republic was founded on providing a truly hands-on approach to managing parking services for our clients, and I am excited this transaction will see us maintain our commitment to that promise, while taking advantage of the technology and systems platform that Impark continues to invest in," Titmus said in an announcement of the sale Friday night. "This is a 'win-win' for everyone involved." Contact staff writer Dave Flessner at dflessner@timesfreepress.com or at 423-757-6340. This story was updated April 8 at 8:15 p.m. to correct the company's name to Republic Parking System in headline and body copy.